One of the first things that users do when they get a broadband Internet connection installed or upgraded, is to visit "speed test websites" on the Internet to measure the upload and download speed of a connection. This is great for bragging rights but also a good way to check if the advertised speed matches the real speed. or if you are getting less than what you are paying for. Most Internet providers tend to use phrases like "up to" to advertise Internet connection speeds, and depending on your location, you may not be able to come close to those speeds. One major problem is that the reliability of those speed tests on the Internet is not overly great. Some show lower throughput even if the Internet connection can handle faster speeds. This can be due to server capacities at the speed test host, the location of the test server in the world, or general routing problems that affect the measured speed. If you run a speed test on a site on Antarctica while you are in Toronto, Canada, you may not get reliable results after all. Speed.io is the first broadband speed test on the Internet that measures the speed of an Internet connection correctly. Every other speed test usually misses a few thousand Kbits at the very least. The service measures the download and upload speed, the maximum number of connections and the response time of the Internet connection. The download speed test result was 14806 Kbit and the result of the upload speed test was 990 Kbit which comes close to the maximum capacities of the 16 Mbit / 1 Mbit advertised speed of my current Internet provider. The developers of Speed.io claim to utilize 50.000 servers world wide for their speed tests which seems an awful lot but would be an incredible infrastructure if this was the case. Still, it does not really matter if they have 1 or 50K servers as long as the speed tests are accurate. 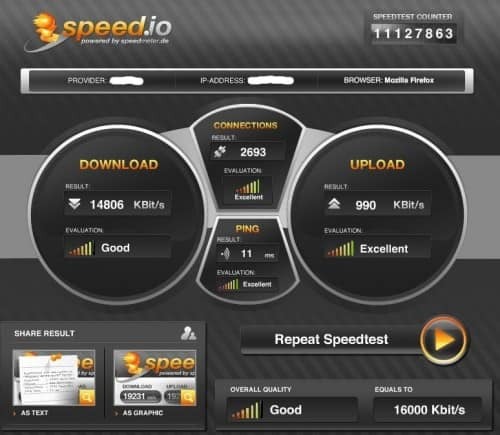 Speed.io is a handy broadband speed testing service that seems to produce better results thanks to the service's network of worldwide servers. Update: You may run into limits though when you run a speed test on a very fast connection. It measured my (new) line's download speed at 45000 Kbit/s and the upload at 2000 Kbit/s. While the download speed is close to the 50 Mbit I get, the upload speed fell a bit short at 2 Mbit instead of the 10 Mbit that I have available at my disposal. I just get an error that tells me to update my Flash version. I though it was up-to-date, but followed the link and updated just in case. Returned to Speed.io and got the same error. Looks cool, but I cant get it to work. Tells me I’m on 6 kb/s, paying for 10…so I want a deduction from my bill! Pah! Started the test, waited, waited … stopped, went to read FAQ, my security appeared in the list mentioning it should be deactivated for the test, I deactivated (I don’t like that, feeling like naked on Broadway), restarted test, waited, waited … stopped, retriggered security, and here I am. Anyhow, I know approximately where my speed stands. If I want to know for sure, I go to ftp://test-debit.free.fr/ and start downloading a 700MB file, wait at least three minutes, and the average download speed result is clean. Seems to be accurate for download but upload failed once and gave wrong numbers other time. It surpassed my broadband package maximum of 758kb/s for uploads by 10kb/s. But 110kb/s for downloads is a bit off. Rated “Good”. And just this morning I was bitching about poor service. Guess it’s time to upgrade my plan. cool! works excellent, thanks for the link! incredibly inaccurate, as 99.9% of these speedtests are, for users with more than 10mbit. But it was quite fun to see the Upload-meter reach the end (13708 Kbit/s), and then reporting “Very Slow”. I guess it did like a full lap internally and came back on the bad side. Your download speed on a certain server will depend on a lot of factors before you can get a reliable information on your full speed. If you’re in Japan, and you’re using a speed test website located on Africa… you’re doing it wrong. Find a speedtest(.net) that has servers all across the world and pick one close to you, tha one should be the most reliable. Not to brag or anything but I think I found a better test…. The above test gives basic speed information but no real info you quality or capability of your connection. My favorite Broadband Speed Test site is http://www.ispgeeks.com. Plus it even gives you graphical data such as this (based on the test above).